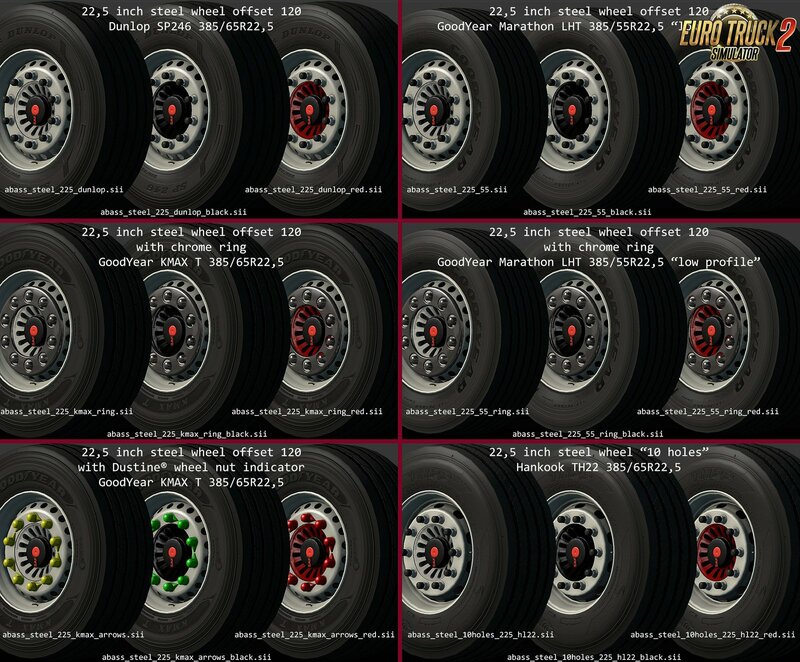 The mega/super/huge/giga trailer wheels megapack for Euro Truck Simulator 2 game. Added 15 more wheels to a total of 64 different wheels. that was particulary notable in dusk and dawn. Users have to edit their own trailer definition to use these wheels. I will gladly add those as a separate mod to this first post. (compared to my old highpoly trailer wheels that are about 53.000 tris). It's not recommended to use these wheels on AI-trailer. *Painted rims will be added in a future update. 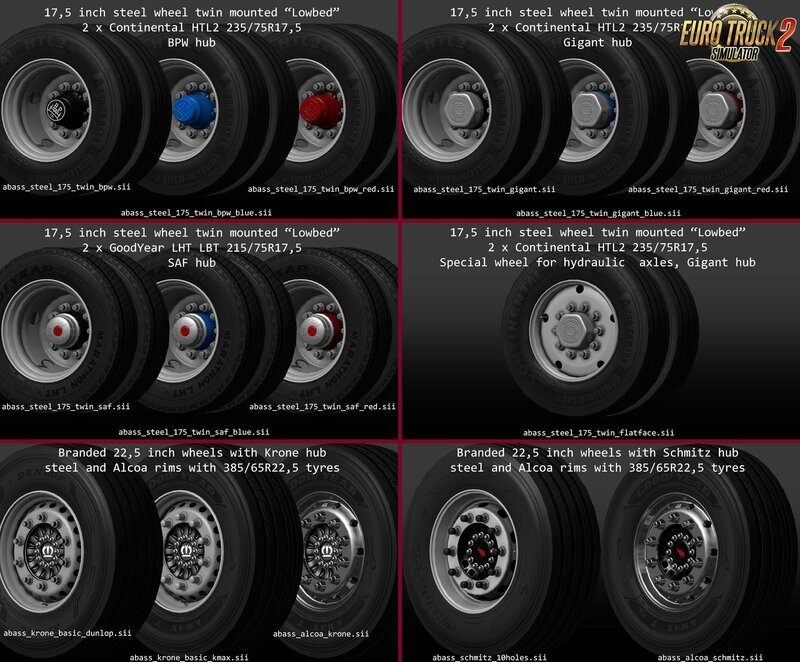 If you want to use these wheels you have to manually edit your trailer definitions. Use a text editor program like notepad or notepad++ to edit your files. 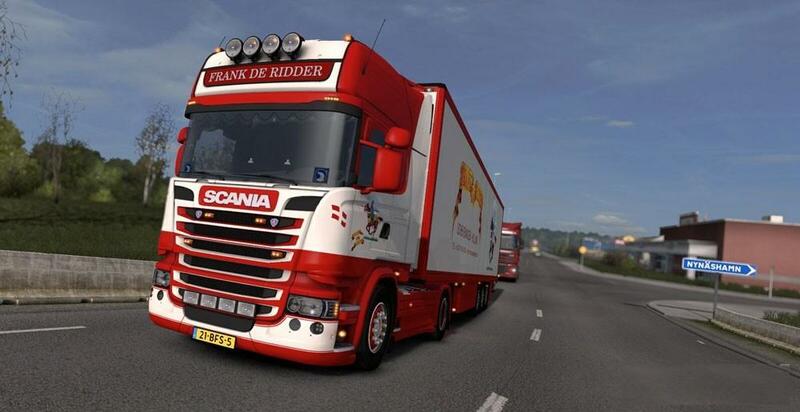 The file you need to edit should be located in /def/vehicle/trailer/"trailer_name.sii" in your trailer mod. Open that file and look for the lines that have a path like /def/vehicle/t_wheel/"trailer_wheel.sii". Chose the wheel you want to use and copy its definition name from below and replace the definition name in the sii-file for your trailer. Remember that the trailer wheels will not change if you already have selected that trailer at the depot. 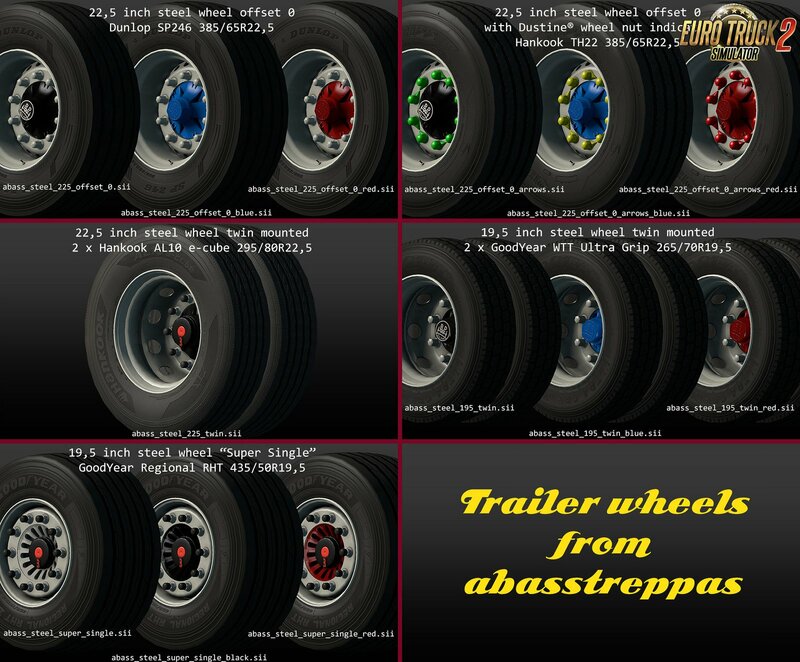 The esaiest way to see if some wheels suit your trailer is to look at it in the trailer browser. 17,5 inch twin mounted abass_steel_175_twin_bpw.sii # Continental tyres and BPW hubabass_steel_175_twin_bpw_blue.sii "abass_steel_175_twin_bpw_red.sii " abass_steel_175_twin_gigant.sii # Continental tyres and Gigant hubabass_steel_175_twin_gigant_blue.sii "abass_steel_175_twin_gigant_red.sii "
abass_steel_175_twin_saf.sii # GoodYear tyres and SAF hubabass_steel_175_twin_saf_blue.sii "abass_steel_175_twin_saf_red.sii "
abasstreppas and any tyre manufacturer represented in this mod. Also thanks to the "beta testers" and especially DaStig that got pesterd the most. 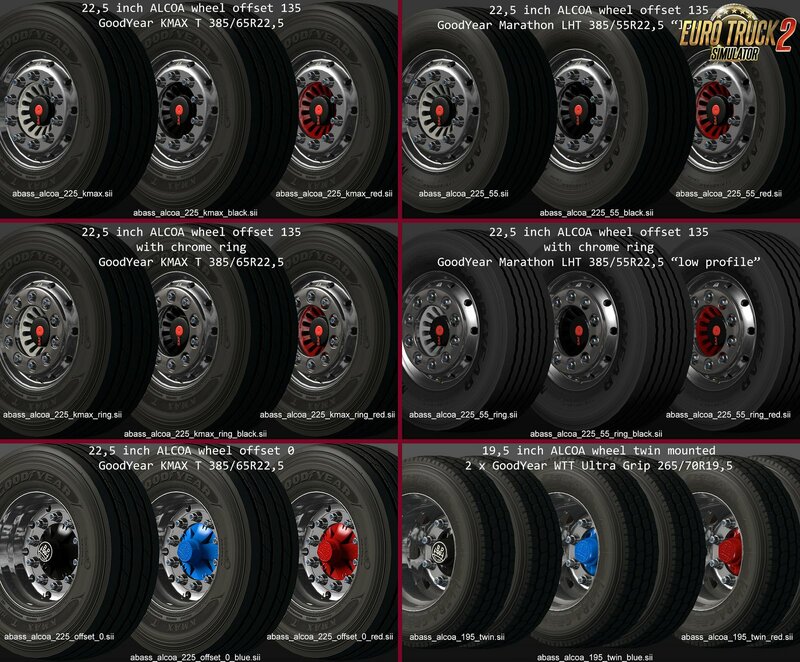 These wheels are free to use on any NON paid mod without permission. The only thing I want in return is given credits for my work. IMPORTANT/WARNING: This stuff is free so don't use it on mods for sale! Basta!